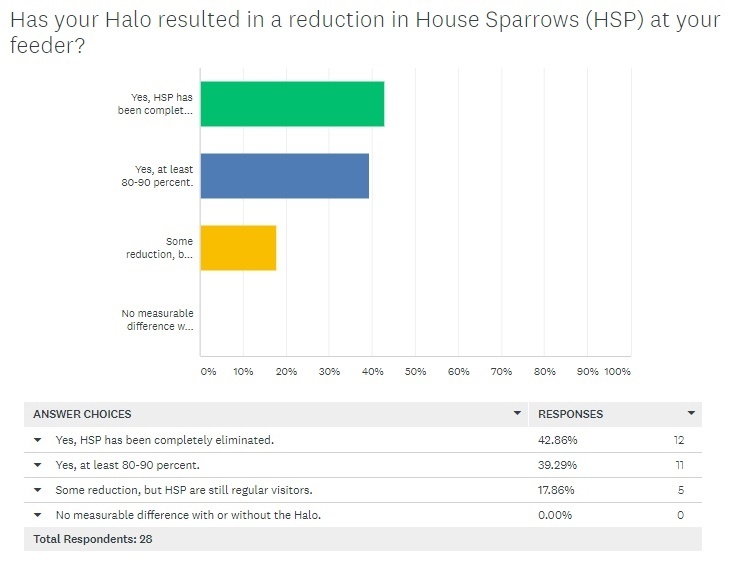 For 2018, we received 29 survey answers on the performance of the Magic Halo in deterring House Sparrows! As hoped, they were mostly positive. 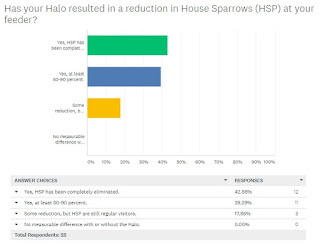 Whether you have had your Magic Halo since early 2018 and already took that survey -- or only recently came on board with one -- please provide your latest/recent feedback using our 2019 Survey (if you have any questions regarding HOSP identity, please read Sialis' Other Brown Birds first, before participating). Your input is critical to the future of our organization, and whether or not we will continue offering the Magic Halo. About 80% of all our users report 80-100% solid effectiveness, but results can vary depending on where you live, level of infestation, and time of year. In addition, juvenile HOSP should not be counted, having not yet learned the "danger" of the hanging wires (fortunately, these are relatively few). 2 of the 4 questions in the 2019 survey are geographical, seeking patterns of explanation. Visit Sialis.org for a complete description and details about using halos with bird feeders. You can also read about it on Feeder Watch.